In Persian lore, the beautiful and brilliant young Scheherazade spun tales of passion and fury, tales of romance and love, tales so exciting and so intriguing – tales of Sinbad the Sailor, and Ali Baba and the 40 thieves, and, of course, Aladdin and his magic lamp – that King Shahriyar spared her life each morning, begging her to resume the stories at nightfall. Of course, you know the story. Not only does Scheherazade tell the stories – 1,001 of them, in fact, — but in so doing manages to make the King fell deeply in love with her and, in so doing, rediscover his kindness and his compassion. It’s a tale of 1,001 nights. A long tale, to be sure, but one that we were reminded of the very first time we met Gazelle and Peyman, a young Persian couple now living in Canada and seeking to celebrate their love and their commitment with an engagement photo shoot in Florence. While there are obvious differences from the tale of Scheherazade and her murderous king (! ), there are parallels, as well: the falling in love, the sharing of a love of art, the belief in a life of adventure. A love of horses, a passion for the sky and for nature. Maybe the reason we thought of the idea of fairy tales is the deep love and the romantic, almost dreamy quality of Gazelle’s and Peyman’s story. They were not interested in a large wedding or in any kind of lavish party. Instead, these two introspective, deep and passionate people came to Florence with only a very few guests, mostly family. “Small and romantic” was the way Gazelle and Peyman described their celebration. 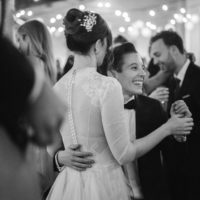 They contacted our studio and asked for something unusual and rare: not wedding photography, not a destination wedding keepsake. Rather, Gazelle and Peyman wanted us to wake early in the morning – long before the Florentines themselves would awaken and the Renaissance city would begin to bustle – and to stroll in the middle of the city. 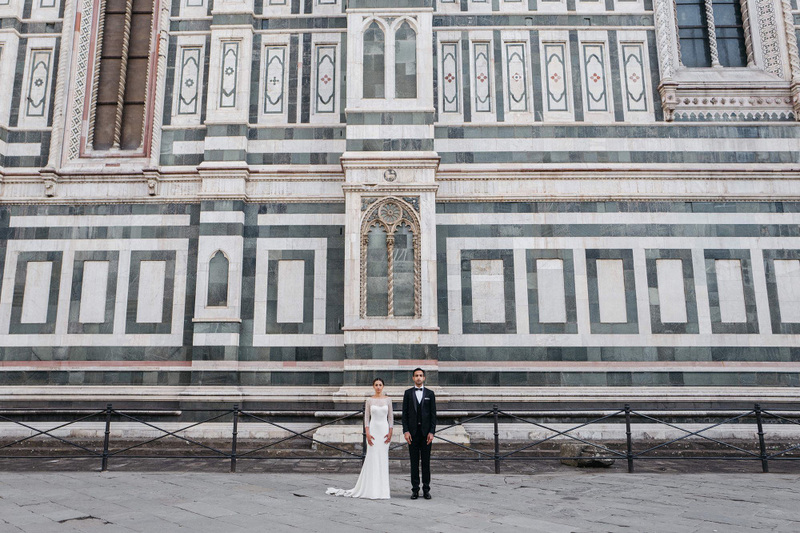 Gazelle and Peyman wanted to be “alone in Florence” – talk about a fairy tale! – and we were delighted and enchanted by the idea. Gazelle wore a dress of simple sophistication. A gown that showed off her stunning beauty, and that literally seemed to allow Gazelle to float across the centuries-old cobble stone streets. The top of the gown was finely stitched, nearly sheer lace with a boat neck and three-quarter length sleeves, dipping deeply in the back to allow Gazelle’s delicate, almost dancer-like back to show. The dress featured a silk long gown with a perfectly flowing train that trailed behind Gazelle in graceful, elegant folds. With her dark hair pulled back straight and worn in a stylish low chignon, Gazelle looked every bit as magical and mysterious and perfect as Scheherazade herself. The only jewelry Gazelle wore was a pair of diamond studs in her ears. From time to time during the morning, they would catch the Florentine morning light and create magical sunbeams around Gazelle’s serene and beautiful face. The back of the gown featured five pearl buttons, the minimal jeweled touch adding exceptional elegance. For his part, Peyman was every bit as handsome and princely in a dark fitted suit with a buttoned vest and luscious plum satin lapels and piping. A crisp white shirt, a smart bowtie and a neat pocket handkerchief finished Peyman’s outfit – the perfect partner to P in both style and sophistication. As Gazelle and Peyman strolled around the city they stopped to hold hands or to exchange a quiet word, a smile, a kiss. The Duomo, rising majestically into the morning sky; small streets with shuttered store fronts; shop windows with seriously stylish mannequins; the Ponte Vecchio, overlooking the Arno and the small shops and buildings that have stood witness to some of the greatest achievements in art and philosophy over the centuries, and, of course, the Uffizi Gallery with its statues beckoning art lovers the world over to enter and to be wowed. Our walk ended at the Rose Garden, just below the Piazzale Michelangelo and facing the city. With its panoramic views of Florence, the Rose Garden gave Gazelle and Peyman the opportunity to take in the city of their romantic engagement photo shoot and see it almost as one might in a fairy tale: just waking, still mostly asleep, ready to face a day full of promise and adventure and maybe even 1,001 new stories before nightfall.